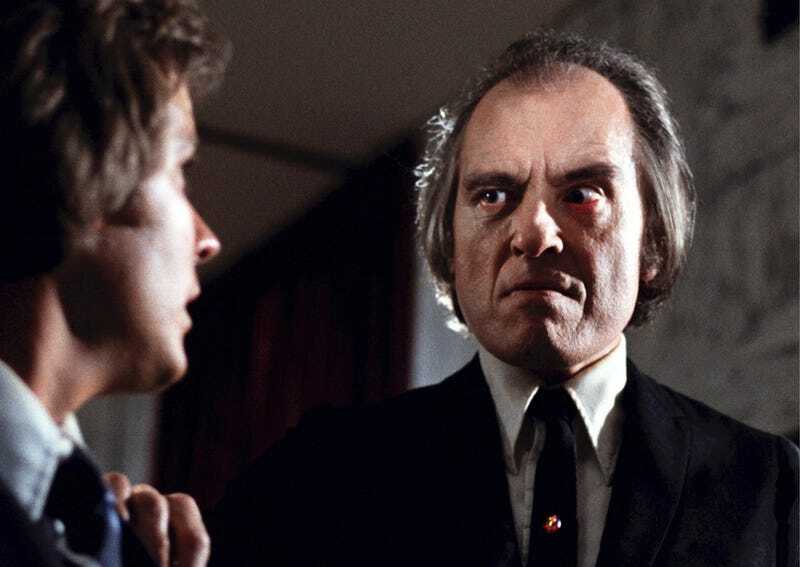 There are some huge 40th anniversaries coming up this year for horror fans; as you’ll see (and probably already realised), 1979 was a mighty big year for the genre. But that’s not all. As long as you’re planning one party, might as well recognise these other spooky classics that are marking milestones in 2019. Disney’s Silly Symphony series – animated musical shorts that delighted moviegoers while providing the studio’s artists an inspiring canvas for experimentation and innovation – kicked off in 1929. The first entry was “The Skeleton Dance,” directed by Walt Disney himself; over a decade, the series picked up seven Oscars and introduced a charismatic new character named Donald Duck. The appeal of “The Skeleton Dance” for horror fans really needs no explanation; 90 years after it first debuted, watching those jaunty, jaw-snapping bone-shakers creeping out of their graves for a wacky dance party is still macabre entertainment at its finest. Another 1929 release worth mentioning: Un Chien Andalou, the legendary surreal short from director Luis Buñuel (his first film) and artist Salvador Dalí. While the film is classified more as “avant-garde” than straight-up “horror,” any movie that opens with an eyeball being sliced open by a straight razor – thanks to a clever and still-gruesome bit of editing – deserves a hat-tip for being one of the first examples of a film pushing the boundaries of what the big screen (and audiences) could handle. 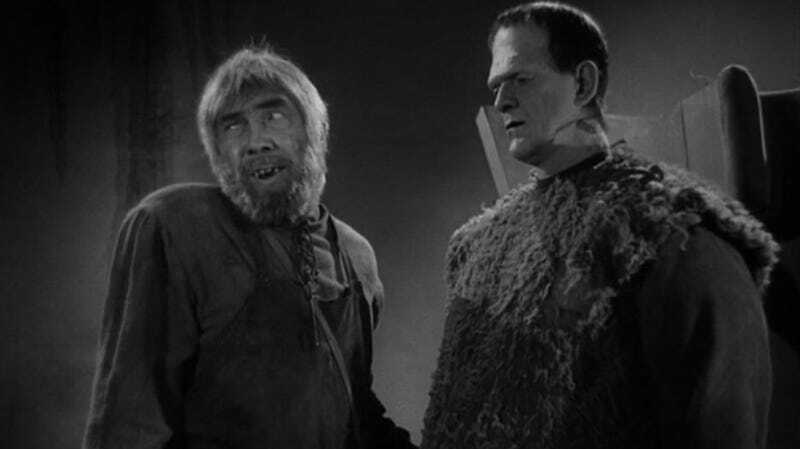 Horror giants Bela Lugosi and Boris Karloff in Son of Frankenstein. Boris Karloff transformed into Frankenstein’s monster for Universal for the third and final time in Son of Frankenstein – the sequel to 1935's Bride of Frankenstein. The film also features the erstwhile Dracula, Bela Lugosi, who turns in a memorable performance as the sinister Ygor, who uses the monster to carry out murderous revenge. The titular mad scientist’s son is played by Basil Rathbone, who had an even more significant career moment in 1939 when he appeared as Sherlock Holmes on the big screen for the first time in The Hound of the Baskervilles. Rathbone later ended up playing the iconic detective in 14 films alongside Nigel Bruce as Dr. Watson – and their 80-year-old version of the eerie Baskervilles story is still esteemed as one of the very best. Not to be associated with the 2009 film of the same name – which was, confusingly, actually a remake of 2003 South Korean film A Tale of Two Sisters – The Uninvited is about a brother and sister (Ray Milland and Ruth Hussey) who are delighted to realise a coastal cottage they’ve admired is being offered at a very reasonable price. They’re less delighted when they realise the cliffs adjacent to the house were the scene of a tragic death – and that the house itself is pretty obviously haunted. There’s a dark mystery motivating the story’s two ghosts, which the living characters desperately try to unravel before another tragedy occurs. 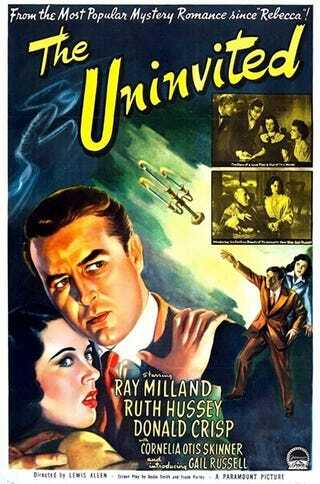 Seventy-five years on, The Uninvited’s serious approach to its supernatural storyline still resonates, as does its stunning black-and-white photography, which earned acclaimed cinematographer Charles Lang one of his 18 (!) career Oscar nominations. By 1959, horror was on firm footing in Hollywood, thanks to the popularity of drive-in movie theatres in the US, the pressing need to compete with TV, and the rise of the often-closely-linked genre of science fiction on the big screen. 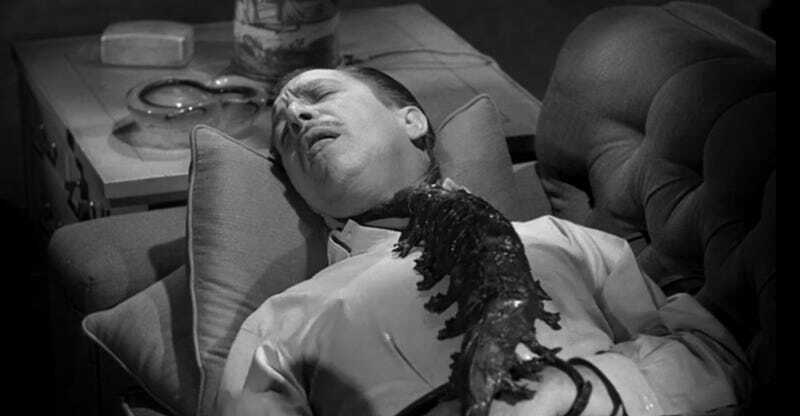 Two campy collaborations between director/impresario William Castle and actor Vincent Price both hit cinemas 60 years ago: The House on Haunted Hill, about a rich maniac’s plot to hide a murder by inviting a bunch of money-hungry strangers to an allegedly haunted mansion, and The Tingler, about a creepy-crawly parasite that feeds on terror. Both films are best-remembered today for Castle’s clever marketing tactics, which included making plastic skeletons fly out at the crowd during a crucial scare in Haunted Hill, and hiding devices that would give certain lucky audience members a real zap of electricity (and, presumably, the meta-fright of their lives) during a Tingler scene when the creature is declared “on the loose” in a cinema. Both films had a monumental impact on a young John Waters, who actually attended one of the rigged screenings, and remained a lifelong fan – in 2017, he even got to cameo as Castle on FX’s Feud. As the 50-year anniversary of the infamous Manson murders (August 8 and 9, 1969) looms, expect carefully-timed projects to start piling up, like Hilary Duff’s Sharon Tate horror flick, Quentin Tarantino’s Once Upon a Time in Hollywood, and Mary Harron’s Charlie Says (which features Doctor Who’s Matt Smith as the cult mastermind). But if you really want to do “something witchy,” to quote Manson himself, fire up experimental filmmaking pioneer Kenneth Anger’s 11-minute occult short Invocation of My Demon Brother. There’s not really a narrative and it’s not exactly “horror,” but it features an unsettling Moog score by Mick Jagger, was filmed in San Francisco (Manson’s hippie stomping grounds before he made his way to L.A.), and co-stars Anton LaVey as “His Satanic Majesty.” Most notably, it also uses footage of actual Manson follower Bobby Beausoleil – a convicted murderer who’s been in jail for five decades, but wasn’t involved in the Manson Family’s most infamous crime spree, and who may actually get paroled this year – playing Lucifer himself. The Amityville Horror, an early example of how “based on true events” (even if it’s not) can be an effective storytelling gimmick, especially when you’re trying to scare the hell out of an audience. And that wasn’t all 1979 had on tap. That same year also saw the release of Abel Ferrara’s grindhouse standout The Driller Killer; David Cronenberg’s body-horror shocker The Brood; influential land-line tale of terror When a Stranger Calls; Werner Herzog’s Nosferatu the Vampyre, starring his frequent muse and possible actual supernatural creature Klaus Kinski; and David Schmoeller’s Tourist Trap, a B-movie about a sinister roadside wax museum that somehow gets more disturbing every time we watch it. Thirty years ago, the horror genre was kind of in an awkward transition period. The big titles of the 1970s and early 1980s were still spawning sequels, mostly tepid ones (Friday the 13th Part VIII: Jason Takes Manhattan; A Nightmare on Elm Street 5: The Dream Child; Amityville 4: The Evil Escapes; Sleepaway Camp III: Teenage Wasteland; Howling V: Rebirth) – with a few standouts, like the guilty-pleasure zombie comedy C.H.U.D. II: Bud the C.H.U.D. and William Peter Blatty’s genuinely unnerving The Exorcist III. But that doesn’t mean 1989 was totally devoid of horror films without sequel numbers after their titles. The Stephen King adaptation Pet Sematary – look for the remake later this year – brought the worst parental nightmare imaginable to the big screen, made all the more alarming by the pitch-perfect casting of one of the scariest kid actors ever (night terrors, meet three-year-old Miko Hughes). Shinya Tsukamoto’s truly singular cyberpunk horror tale Tetsuo: The Iron Man is still (rightfully) a midnight-movie draw. And even though it never turned into another Freddy Krueger-esque franchise for A Nightmare on Elm Street creator Wes Craven, Shocker remains weirdly enjoyable. That’s because of its out-there tale of a serial killer who morphs into electricity when he’s executed, which allows him to crackle around possessing random people – and also its “wait, is that...” cast, which includes Dr. Timothy Leary, Elm Street star Heather Langenkamp, Craven himself, Ted Raimi, Peter Berg, and none other than Mitch “Skinner from X-Files” Pileggi as the psychotic villain. Twenty-five years ago, Wes Craven and Heather Langenkamp reunited again for Wes Craven’s New Nightmare, which imagined that Freddy Krueger – an evil being that exists beyond Robert Englund’s iconic portrayal of the character – was invading the “real” world, with the director and actors playing “themselves.” New Nightmare was released two years before Scream made self-referential horror all the rage, but Craven’s version approaches the idea with zero winks or jokes. The same year saw a few other interesting experiments hitting cinemas as Hollywood found itself in a lull between first-wave slasher movies and the Scream imitators that would soon begin rushing into production – movies like Wolf, which turned Jack Nicholson into a werewolf; Interview With a Vampire, which turned Tom Cruise into a glam creature of the night; John Carpenter’s underrated H.P. Lovecraft/Stephen King homage, In the Mouth of Madness; and comic adaptation The Crow, a movie so unique for so many reasons we’re glad every remake attempt has (thus far) failed. We also have to wish a happy quarter-century to loopy horror comedy Cemetery Man, still Rupert Everett’s finest hour; and the year’s other notable vampire movie, Michael Almereyda’s elegant and understated Nadja. In a year with some excellently horrific standouts (never saw Takashi Miike’s Audition? Want to be freaked out of your skin? Have at it! ), we’d like to single out two particularly significant genre entries, movies whose ghostly fingerprints are still all over cinema even 20 years later. The first is The Sixth Sense, which blew so many minds with its clever set-up and white-knuckle frights it racked up six Oscar nominations, including Best Picture and Best Director for M. Night Shyamalan. At the time, his name was not yet synonymous with the twist ending – a device he relied on so much in his subsequent films that it became a punch line, though his latest pivot into the superhero genre (Glass is out next week) suggests he won’t be repeating himself again. But even beyond its surprise ending, The Sixth Sense holds up remarkably well as a film set in the real world – a place where kids and adults can be desperately lonely, even in a crowd – that presents a version of life after death that’s actually pretty reasonable (in addition to being legitimately scary). Of course a person who’s been wronged in life would want to set things right, and of course they’d seek out anyone, even an awkward little kid, on the other side of the veil to help them out. Boo! However, for all its clever staging up to that big reveal, The Sixth Sense was still far more conventional than The Blair Witch Project, which wasn’t the first “found footage” movie, but was the first to go mainstream, rake in hundreds of millions of dollars in pure profits, and actually make people think it was real. Blair Witch, about a trio of student filmmakers who get lost in the woods never to be seen again (except in their “recovered” film), jump-started an entire subgenre that yielded a few winners (including fellow massive success Paranormal Activity), but also many, many stinkers. 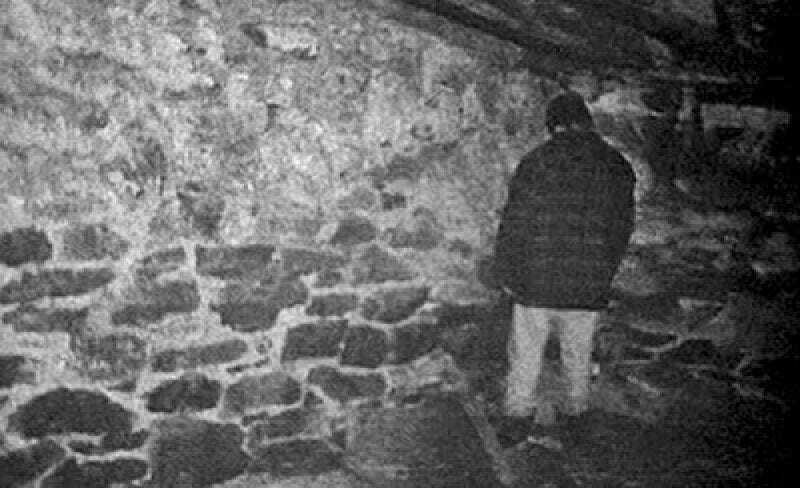 And – apologies to Bruce Willis, but Blair Witch’s stand-in-the-corner final shot is the scariest thing that happened on the screen in 1999. The O.G. film’s impact lingers so much, it spawned a surprise Blair Witch sequel in 2016. Just in case you weren’t feeling older than dirt already, here are some horror movies that are turning 10 years old this year: Drag Me to Hell (hey, Sam Raimi...time to think about directing another gruesome genre flick...please? ); The House of the Devil (an homage to vintage horror so authentic it’s basically timeless); Jennifer’s Body (a movie written by, directed by, and all about women that’s slowly coming around to the cult status it’s long deserved); and Zombieland, which is finally getting a sequel this year. Good thing the movie’s survival snacks of choice – Twinkies, of course! – probably have a shelf life that’s way longer than one measly decade.